Angelo Rocca (1545–1620) is best known as the founder of the Angelica Library, the first public library in Rome. He was also head of the Vatican printing office and a prolific author and philologist in his own right, with more than sixty works to his name. One of those was De campanis commentarius (A Commentary on Bells). Published in 1612, it is one of the earliest comprehensive studies of bells and bell ringing. 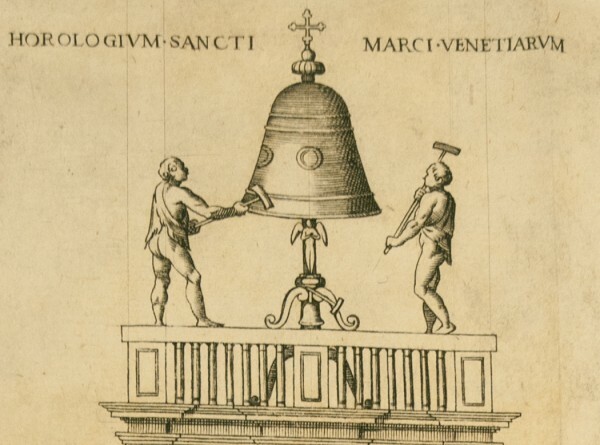 Working in the Vatican gave Rocca a broad knowledge of bells and their many uses. In De campanis, he investigates the origins of bells, bell terminology, the office of the bell ringer, and bell ringing customs for secular and ecclesiastical occasions. One chapter is entirely devoted to musical bells, and there is a special chapter on clock-chiming at the end. Two illustrated folding plates show the 24-hour astrological clock of the tower of St. Mark’s Cathedral in Venice, and the elaborate chiming clock of St. Lambert’s in Liège. Also illustrated are a giant bell requiring a team of 24 ringers, and a bell-organ which uses 33 bells sounded by one man from a keyboard. This extremely rare first edition was recently purchased and added to the collections of the Rubenstein Rare Book & Manuscript Library in honor of J. Samuel Hammond (‘68, MTS ’96), who retired this fall after more than forty years of service to Duke, most of them spent in the Libraries. Sam is perhaps better known (or heard) as Duke’s official carillonneur. Every weekday at 5:00 p.m., and also before and after Sunday worship services and on occasional special events, he ascends the tower of Duke Chapel and sits down at a special keyboard that operates the carillon’s 50 bells, which range in size from 10 pounds to five tons and span four chromatic octaves. Sam began playing the carillon as a Duke undergraduate in 1965 and was appointed University Carillonneur in 1986 by President H. Keith H. Brodie. He is only the second person to occupy the post. Although he has retired from the library, Sam will continue playing the carillon on weekdays and after chapel services, carrying on the familiar refrain of another day at Duke.